What Is a PCT File? A file with the PCT file extension is a Macintosh Picture Image file and was the default file format for the (now discontinued) QuickDraw Mac program. Though some applications still use the PCT format, PDF has all but replaced it. The image data in a Macintosh Picture Image file may be in the original PICT 1 format or the PICT 2 format introduced in Color QuickDraw. The first can store eight colors while the second and newer format supports thousands of colors. Depending on the application that created it, you may find Macintosh Picture Image files with either the .PCT or the .PICT file extension, but both file types are in the same format. Though the QuickDraw program is now discontinued, PCT files of both formats can be opened with several popular photo and graphics tools, some of which you may already own or have installed. For example, pretty much every Adobe tool can open PCT files, including Photoshop, Illustrator, Fireworks, and After Effects. If you're using Photoshop to open the PICT file, you might need to use the File > Import > Video Frames to Layers... menu item. In addition to these applications, programs like XnView, GIMP, Corel PaintShop Pro, Apple Preview, and probably most other popular graphics tools, also include support for the PICT 1 and PICT 2 formats. We recommend converting the PCT file you have to a format that's more popular and usable in modern image editors and viewers. That way you can share the image with others and be confident that they'll be able to open or edit it. You can read more about converting PCT files in that section below. If you find that a program on your PC is the default program that opens PCT or PICT files when you double-click on them but you'd rather it be a different program, You can Change the Default Program for a specific file extension in Windows. The easiest way to convert a PCT file to another image format is to use XnView. You can do this from the File > Save As... or File > Export... menu to convert PCT to any number of other, more common, image formats. You might also have luck using one of the PCT openers mentioned above. Some of them might support exporting or saving an open PCT or PICT file to another format. Another option is to upload the PCT file to Online-Convert.com. Once uploaded to the website, it will convert the PCT file to JPG, PNG, BMP, GIF, and several other similar image file formats. Being an online tool, this method works equally well on any operating system, whether it be Mac, Windows, Linux, etc. What's a CRW File and How Do You Open One? 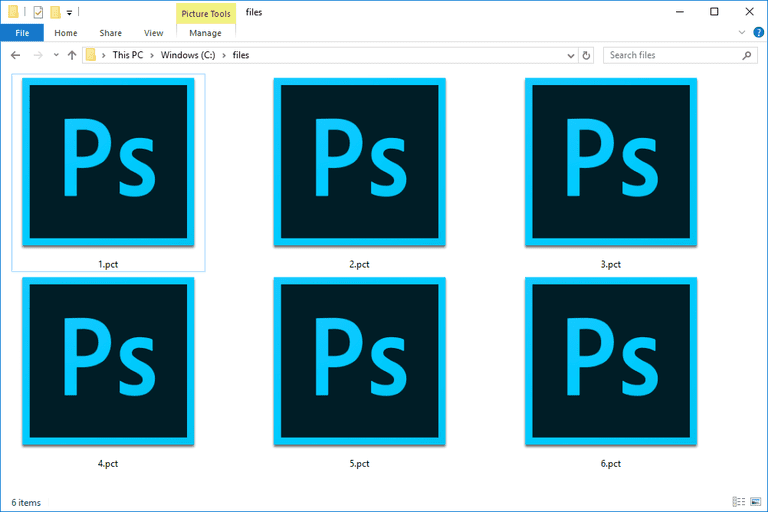 What's a PSD File and How Do You Open One? What's an HDR File and How Do You Open One? What's a PAT File and How Do You Open One? What's a PCX File and How Do You Open One? What's an SRF File and How Do You Open One? What's an EPS File and How Do You Open One? What's a PDD File and How Do You Open One? What's a GIF File and How Do You Open One? What's a PPS File and How Do You Open One? What's a PEF File and How Do You Open One?